To Americans, Asia has always had an air of mystery about it— the exotic Orient. No country embodied that mystery as much as China, the fabled Cathay of Marco Polo and Kublai Khan. China’s history goes back thousands of years, and for centuries it was one of the most advanced civilizations on earth. But that civilization was almost unknown to people in Western Europe and the Americas. It was separated from them by vast distances, by oceans, mountains, and deserts. For centuries, the Chinese preferred to keep contact with the outside world to a minimum. They feared that Western countries would try to rule over China, as they had done in India and the Philippines, so they placed stiff restrictions on trade with the West. Trade did not open up until 1842, when the British defeated the Chinese in the Opium War and forced them to open more ports and relax restrictions. Sleek American clipper ships soon began to call at Chinese ports for cargoes of tea, silk, and porcelain. The sailors on these ships brought with them tales of mountains of gold in their homeland—the gold that had been discovered at Sutter’s Mill in California in 1849. The Chinese imagined America as a land of opportunity, a place where they could become wealthy in a short time and then return to their families in China. Soon they were making the seven-thousand-mile voyage east to California by the hundreds. Many did so at great risk; until the 1860s, leaving China without the government’s permission was a crime punishable by death. These early Chinese immigrants were mostly men from the working classes. Wealthier Chinese saw no need to risk their government’s wrath by leaving the country. The immigrants had no knowledge of English or of American customs. Usually they signed on with a labor contractor and worked under a Chinese foreman who had some knowledge of English and could arrange to find work. Thus bands of contract “coolie” workers began to appear in the West. They worked on farms and in mines and factories, and they helped build the transcontinental railway. These bands of Chinese workers were often in demand because they worked quickly and efficiently and for considerably lower wages than white workers. Many Chinese also struck out on their own, as miners or in services that the mining towns needed. They were quick to see that, with few women around, the Western towns and mining camps needed such services as laundries and restaurants. And they were willing to take servants’ positions and other jobs that white workers scorned. By 1870, there were more than sixty-three thousand Chinese in the United States, all but forty-five hundred of them men. But despite their industry, the Chinese found no welcome in the United States. This was partly because their features and their customs were startling to American eyes. Their deeper skin tone and different facial features had not been seen before. They dressed differently and wore their hair in long single braids called queues. Their language was unintelligible, and their religion (chiefly Buddhist) was branded as heathen. The Chinese initially made little effort to change their customs or adapt to the United States because they assumed that they would soon return to China. A Chinese man could not cut off his queue, for example, because he was required by Chinese law to wear his hair that way and could not return to China without it. Cutting off queues became a favorite prank in America; whites would sneak up behind a Chinese, snip, and run, laughing at the rage and grief their act provoked. Usually these pranksters had no idea that their joke had doomed the victim to exile. Appearance and customs were not solely responsible for the deep prejudice the Chinese encountered. The presence of the industrious coolie bands sparked a deep fear in some Americans—the fear that they would lose their own jobs. This fear was strongest in California, where most of the Chinese lived, but it emerged elsewhere, too. When workers at a shoe factory in North Adams, Massachusetts, went on strike in 1870, the factory owner fired them and replaced them with a group of Chinese workers from San Francisco. The townspeople stoned the Chinese as they exited the train that brought them to North Adams, but soon the new workers were producing more shoes for lower wages than the white workers had. Other factory owners also employed Chinese workers. Manufacturers began to talk of the virtually limitless supply of cheap labor from China. Some people said the Chinese would become America’s new underclass, a “yellow proletariat” of migrant workers that would replace slaves in agriculture and white workers in factories. These and other speakers brought anti-Chinese feelings to a head, and violence was the result. In incidents throughout the late 1870s, Chinese were stoned, robbed, driven from their homes, and murdered in towns in California, Wyoming, and Oregon. In a riot in 1880, whites destroyed every Chinese home and business in Denver, Colorado. The Chinese had no recourse in these incidents. They were not U.S. citizens, and China was powerless to intervene, despite a treaty between the United States and China that was meant to assure them good treatment. In 1882, Congress bowed to pressure from constituents mainly in the West and South and voted to suspend immigration from China for ten years. The Chinese Exclusion Act of 1882 was followed by similar acts that banned or severely limited Chinese immigration through the 1920s. Chinese could still enter the country if they were children of U. S. citizens, but few could meet this condition. Chinese immigrants were not allowed to become naturalized citizens, so the only Chinese-American citizens were those who had been born in the United States. Since most of the immigrants had not brought their wives, there were very few Chinese-Americans who were born in America. As before, most of the immigrants were men. Around the turn of the century, the ratio of Chinese-American men to women was greater than twenty-five to one. This meant that most Chinese could not marry and start families, a situation that helped keep them separate from the rest of society. 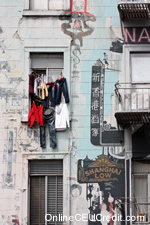 The Chinese lived apart, mostly in the Chinatowns of various large cities. Because they could not be sure of equal treatment under American law, Chinese-Americans tended to rely on their own organizations—family clans and secret societies called tongs —for law enforcement, charity, and other social services. The tongs were often involved in illegal activities, and prostitution, drugs, and gambling were commonplace in the Chinatowns of the late 1800s. So was poverty. Most of the Chinese who had dreamed of making a fortune in America and then returning to their homeland as wealthy men were unable even to afford the passage back. Anti-immigration forces emphasized conditions in the Chinatowns in their fight to deny rights to Asian-Americans. They did not see that prejudice and economic factors kept the Chinese separate and caused most of the problems in Chinese areas. Rather, ignoring the fact that many of the clients in the gambling halls, opium dens, and brothels of the Chinatowns were white, they claimed that vice and poverty stemmed naturally from the Chinese character. White women were warned never to go alone near the Chinese, even to a laundry, for fear they would be kidnapped. Ironically, few of the Chinese immigrants would have remained in the United States if they had not encountered prejudice. Harassed and held back at every turn, they were unable to achieve their goal of earning a bit of money and returning home. They were forced instead to make permanent homes in the United States. Conditions among Chinese-Americans gradually changed in three significant areas. First, the small number of Chinese women in the United States gave birth to daughters as well as sons, and the imbalance in the ratio of men to women grew smaller. In 1930, immigration laws were changed to allow some Chinese wives to join their husbands, and the laws were loosened further in the 1940s. By this time the ratio of men to women was only about three to one. This meant that more Chinese-Americans were able to start families. As the character of Chinese neighborhoods changed and became more family-oriented, vice declined and the tongs lost their power. Rather than being places to avoid, Chinatowns became tourist attractions. The second area of change was in economic conditions. Relying on hard work and their own credit organizations, the Chinese were able to make successes of many business ventures. In the 1940s, World War II created new opportunities in factories outside Chinatowns. The Chinese moved into new lines of work and new neighborhoods. The third change was in the amount of education children received. The Chinese traditionally placed a great emphasis on education. In the United States, parents worked hard and scrimped to pay for their children’s education. More and more Chinese graduated from college and entered the professions, usually in the sciences. As a result of these changes, Chinese-Americans today have higher incomes and hold higher-status jobs than Americans in general. As they have become more successful economically, they have moved from the old Chinese neighborhoods and mixed more and more with mainstream society. Because the United States remains an attractive destination for Chinese immigrants, newcomers who enter the country legally and illegally have kept the old neighborhoods alive. The Chinese today are the largest Asian group in the United States, and over the years prejudice against them has dwindled, though it flares up occasionally. Prejudice dies hard. -Pascoe, Elaine. Racial Prejudice: Why Can’t We Overcome? Franklin Watts, New York, NY, 1997. The preceding section contained information about the history of Asian Americans and prejudice. Write three case study examples regarding how you might use the content of this section in your practice. How do Chinese Americans’ incomes and job positions compare with those of the average American? Record the letter of the correct answer in the Answer Booklet.